Editors Note: There is one video, one report, and one audio file associated with this Press Release. 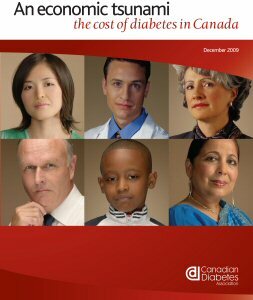 In a report released today, An Economic Tsunami: The Cost of Diabetes in Canada, the Canadian Diabetes Association has introduced an important new tool in the fight against diabetes in Canada: the Canadian Diabetes Cost Model. The Model details the dramatic increase in the prevalence and cost of diabetes in Canada, both of which have escalated sharply over the last decade and are expected to continue their rapid ascent for the foreseeable future. "For the first time, Canada has a Diabetes Cost Model specifically based on Canadian data to estimate both the current and future costs of diabetes," said Ellen Malcolmson, President and CEO of the Canadian Diabetes Association. "If left unchecked, the economic burden of diabetes in Canada could escalate to nearly $17 billion by 2020, an increase of more than $10 billion from 2000, and the number of Canadians diagnosed with diabetes will have nearly tripled. The results are a sobering reminder of the action required to reduce the burden of diabetes in Canada while improving the individual health for people living with the disease." Be further developed to provide province-specific data that will allow for even broader application to assess the cost effectiveness of potential diabetes interventions, programs and services that could aid governments in developing future diabetes strategies. Ultimately, the Model is an important tool in the fight against diabetes in Canada. Future enhancements could expand the variety of analysis possible with the Model. Today nearly one in four Canadians either has diabetes or prediabetes. More than twenty people are diagnosed with the disease every hour of every day. Interventions that reduce the prevalence of diabetes could significantly reduce costs. For example, a reduction in current incidence rates of two per cent a year in conjunction with better disease management leading to fewer visits to doctors' offices could lead to a significant cost saving (9% in direct cost and 7% in indirect costs). "To offset costs and reduce the incidence of diabetes, we need to invest resources to enable better diabetes management, which will help decrease both hospitalization rates and medical complications associated with diabetes," said Malcolmson. "Currently, the Association is taking steps to address the economic burden of diabetes in Canada by supporting research, focusing efforts and resources, and providing education and services to both people living with diabetes, as well as healthcare professionals." Investment in high-quality, investigator-driven research, as well as strategic, targeted research partnerships with Canadian universities, research institutions and hospitals. While the Canadian Diabetes Association continues to lead the fight against diabetes by helping people with diabetes live healthy lives while we work to find a cure, we cannot do it alone. Governments must recognize this growing burden and take immediate action. Across the country, the Canadian Diabetes Association is leading the fight against diabetes by helping people with diabetes live healthy lives while we work to find a cure. We are supported in our efforts by a community-based network of volunteers, employees, healthcare professionals, researchers and partners. By providing education and services, advocating on behalf of people with diabetes, supporting research, and translating research into practical applications - we are delivering on our mission. For more information, please visit www.diabetes.ca or call 1-800-BANTING (226-8464). Vertical Polarization, D/L Freq. 3820MHz. To examine the potential of policy interventions to offset the economic burden of diabetes on Canadians. The two main sources of data used for the estimate and forecasts come from the National Diabetes Surveillance System (NDSS) and Health Canada's study the Economic Burden of Illness in Canada (EBIC). The model aimed to integrate the administrative prevalence and incidence estimates from NDSS with the economic cost estimates from EBIC. To view the video associated with this press release, please visit the following link: www.youtube.com/watch?v=DqrcjRhUQzo. To view the report associated with this press release, please visit the following link: http://media3.marketwire.com/docs/cda1207report.pdf. To listen to the audio file associated with this press release, please visit the following link: http://media3.marketwire.com/docs/cda1207anr.mp3. 1 Canadian Diabetes Association. An Economic Tsunami: The Cost of Diabetes in Canada. November 2009.